Aalayam - Colors, Cuisines and Cultures Inspired! : An Island getaway! Some of us still have a few more weeks of winter left. But many of us are already looking forward to longer days and warmer temperatures. The yearning to travel is slowly surfacing. It's never too early to give in to your wanderlust and plan for a vacation. So, will you be traveling this year? Where will 2013 take you? Everybody's idea of a vacation is different. From theme parks to serene beaches to mountain cabins to cruise ships (or not - given the recent carnival cruise fiasco) the options are plenty! How about an island getaway? I want to share this travelogue from our trip to Mackinac (MAK-in-awe) Island last summer. 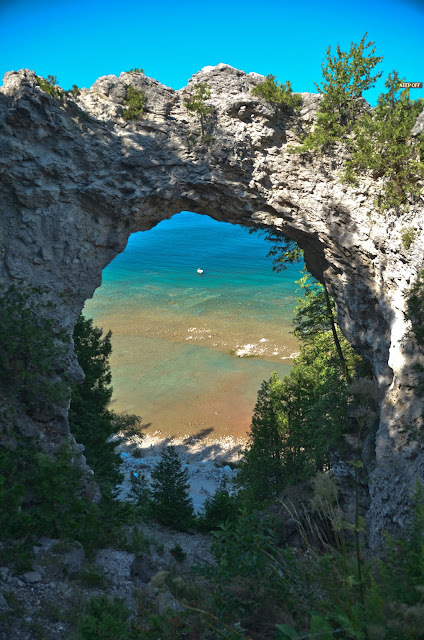 Located in Lake Huron and accessible by boat, Michigan's Mackinac Island is truly a great weekend Midwest getaway! There is plenty of good information available on the www for things to do and see but be rest assured that it has something for everyone in the family - culture, arts, the outdoors, history and plenty of fun! Since our move to Ohio, we had heard so much about Michigan's Up North - the vernacular term for the Upper Peninsula. We wanted to discover it for ourselves. 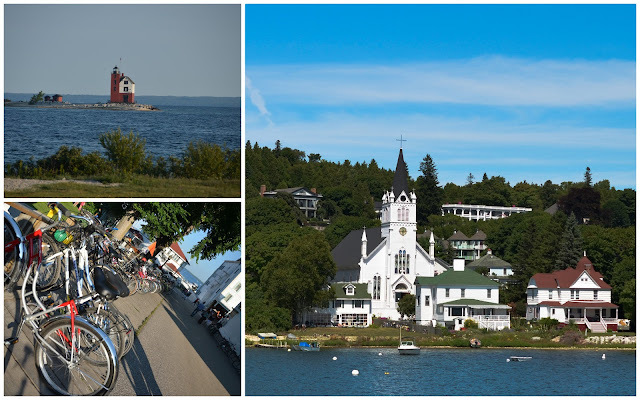 We picked a sunny weekend and hit the road to discover Mackinac! And it was magical! The gorgeous shoreline of the great lakes lined by beautifully sculpted rock cairns, horse drawn carriage rides that transport one back in time, curvy streets dotted with quaint little cottages and fresh blooms, glorious sunsets, water-front dining, Victorian architecture, run-ins with history at Fort Mackinac, bike rides down windy roads, milling tourists, fudge shops - you name it, Mackinac has it! The island does not allow motor vehicles and is perfect to escape the daily humdrum and the mechanical chaos of modern living. We thoroughly enjoyed biking the Island and my little one utterly loved his new found independence. In fact, biking is my most cherished memory from Mackinac. Enjoying the verdant landscape, feeling the wind in our faces and leaving our cares behind was invigorating, to say the least. 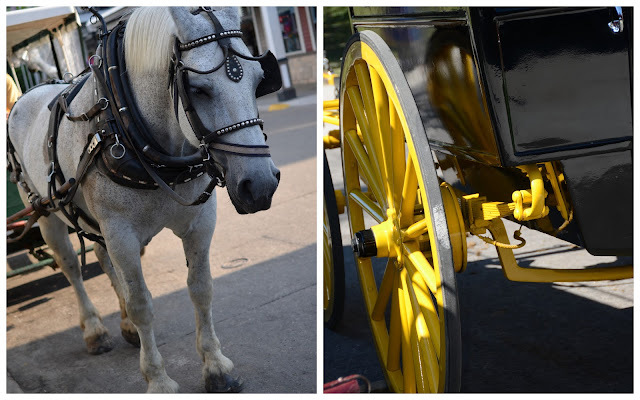 As the horses sauntered down the streets, transporting tourists in colorful carriages, the rhythmic sound of their hooves infused the air with a sense of tranquility. According to this website, Mackinac has the world's oldest and largest buggy livery in the world! Now, because of their no motor vehicle policy, Mackinac was included among the top 10 Sustainable islands of the world! 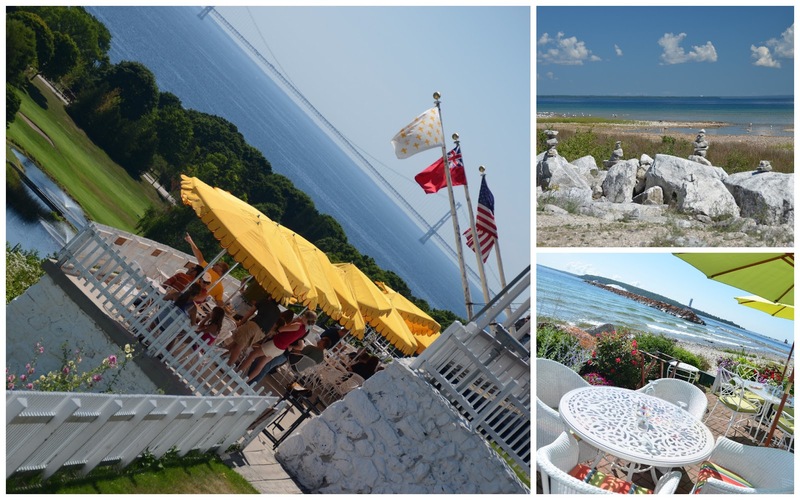 The island offers plenty of great accommodations and we chose the Iroquois for its Conde Nast approval and were simply blown away by its charm, near perfect location and great water views! The Carriage house dining room at the Iroquois had a great array of options on their carte du jour and we were not disappointed. And for those of you that like to bring back memories, the place is chock-full of picture-worthy hotspots - The Grand Hotel, Round Island Light house, Arch Rock, St Anne's church and more. Whether you are looking to relax and recharge or simply spend some quality family time- Mackinac is ideal. 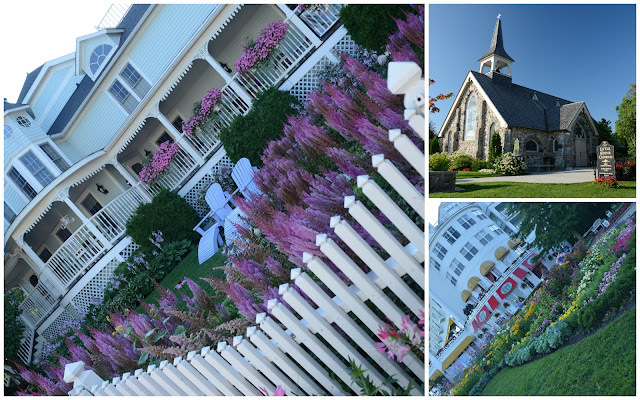 Buildings and blooms offer plenty of eye candy! 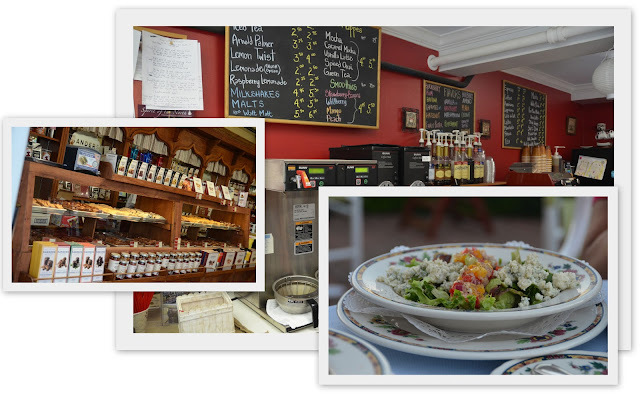 With so much to offer, Makinac is must-see! Do you like to travel and explore our beautiful world? We do too and periodically we will feature a new destination and yet another travel experience. If you missed Supriya's travelogue on Puerto Rico click here. While we are on the subject of travel, let me share a favorite travel photo blog - Canvas of Light by Daniel Nahabedian. If you are not familiar with his work, I urge you to check it out. Daniel is brilliant! He is the real McCoy when it comes to travel photography and looking at the world through his lens is a mesmerizing experience! p.s: All images in this post were taken by my husband and are subject to copyright! Please email for permission to use. Thanks ! Nice place to holiday. UJ pics are good. Thanks for reading Meera aunty! Yes, it was a fun fun holiday - beautiful place! And will pass on your appreciative words to Uj. Please share the link to our blog with all your contacts that may be interested in our content. Supriya is up next with another good topic! is the island something like an amish settlement ? I think we should explore, living in midwest it should be a no brainer. About your party planning, you can reach out anytime, or even call me - you have my number right ? No, it is not an Amish settlement. It was apparently popularized as a vacation hotspot by wealthy Midwesterners of the Victorian era who left the big city behind to enjoy the great water views and dance to Strauss waltzes (something I found on the www). 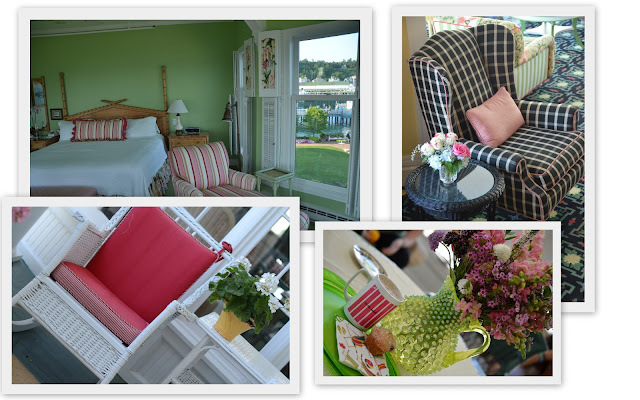 Hence the victorian influence and shades of luxury all around the island! No truly, you should go. We were pleasantly surprised and enjoyed our stay thoroughly. rkramadh: thanks for reading! I am only beginning to discover the beauty of the midwest and the greatlakes! i am excited that there is so much to see and explore. I have heard about the great bear sand dunes might do a post on that some day! It feels wonderful to have the pics appreciated by a local who knows how truly gorgeous the region is. Yes! with the weather warming up - road trips to li'l known midwest towns along the shores might not be a bad idea at all!